Like many in Britain I retired for the night confident that I would be greeted the next morning by news of a narrow victory in the US presidential election and so I was . . . but not the candidate whom I was expecting. Donald Trump's victory is, by any definition, one for the record books. He is the first president since Eisenhower to enter upon his duties without having held political office at either the state or national level. A better analogy might be with Wendell Wilkie, whose selection as a Republican presidential nominee upended the Republican political establishment and placed at its head a businessman and former Democrat. One should refrain from pressing that analogy, however, for whatever his conservatism on domestic issues, Wilkie was far removed from the prevailing isolationism that dominated the Republican Party until the early 1950s, while Trump's foreign policy agenda would seem to have more in common with that of "Mr. Republican", Senator Robert Taft. A comparison of state-by-state victories in 2000 (another close election) and 2016 demonstrates that while Hillary Clinton captured three states lost by Al Gore (Nevada, Colorado and Virginia), and may also have taken New Hampshire, she lost the Rustbelt by a clear margin and with it the states of Iowa and Wisconsin (Dukakis states in 1988), Pennsylvania, and, possibly, Michigan. It has been many years since Midwestern voters have had the opportunity to determine the nation's political destiny but they have now done so with a vengeance. Like 2000, albeit by a somewhat narrower margin, the winner of the popular vote has suffered defeat in the electoral college. Such is the nature of American politics. A major new study of growth and decline across the global Anglican Communion is coming out, published by Routledge. It provides in depth academic research by an international team from leading universities, giving both overall coverage and detailed case studies from five continents. A discounted fee is available to full time post- or under-graduate students. The day conference is part of the 175th anniversary celebrations of Whitelands College. The wealthy lost a great deal after 2008. But what they lost was investment capital, not rent money. The blow for most was not existential. It did not change their lives. For those who used their money for consumption, the impact was substantial. As the trade crisis spread, people lost their jobs, and those who found new jobs were being paid a fraction of their previous salary. 2008 had a different impact on average citizens. But political control remained in the hands of the investor class, which had organized its thinking around the ideology of interdependence. It remained focused on the stability of the financial system rather than the surge in unemployment, underemployment, and the public’s loss of buying power. This played out differently in different countries, but it played out almost everywhere. The issue that 2008 has raised is the importance of nations and the primacy of a national leadership to protect the interests of the nation as a whole, and not the global system or the interests of the financial community. The re-emergence of nationalism is the logical outcome of the failure of interdependence. Part of the assumption of the pre-2008 ideology was that aggregate economic growth benefits everyone. Post-2008 ideology believes that stagnation is paid for by the middle and lower classes. This leads to a political showdown. A new ideology has emerged. It is not yet in power, but it is growing. It argues that the nation-state controlling and limiting its dependence is superior to interdependence. It also argues that the nation-state provides benefits that globalism cannot: a sense of community, the preservation of culture, a sense of self. This argument says that humans without a nation are humans without a community. They are alone, lonely, and helpless. And at the root is the argument that there are more important things than money. It's a bright and sunny June day and British voters are determining our future in Europe. For all but the first two years of my life, the United Kingdom has been a part of the European community and there is no question that a decision to leave will fundamentally alter the way in which our affairs, domestic and foreign, are conducted. While the Leave and Remain camps have both striven to prove the economic benefits of their stance, the truth is that neither side really knows what the final outcome of leaving the EU will be. If the European Union is not the Leviathan that some believe, neither is it the harbinger of an ever more harmonious Europe. Since the end of the Cold War, as continental Europe has sought to promote a more perfect union (to use the phraseology of our American cousins), it has become increasingly insular in its ability both to look beyond its borders and to handle political crises on the periphery. What began with the tragedy of the Yugoslavian civil war has come full circle with the Syrian refugee crisis. Despite the populist backlash that has enveloped France, Germany and Eastern Europe, the enthusiasm for greater federalism in both Brussels and Strasbourg seems unabated. The only action that may engender greater realism at the political centre is for a nation state of significant economic weight to take the decision to withdraw. My vote to leave the European Union is thus predicated neither on the purported economic benefits nor on the supposed ability to control our borders (my wife and I still had our passports checked while entering France by train two weeks ago), but on the faint hope that it will concentrate the minds of those who set the policies of the EU. There are no guarantees, of course. Italy, the Austrian statesman Clemens von Metternich once famously remarked, is a geographical expression and "Europe" is no less. The drive to shoehorn European nation states into a "United States of Europe," often in despite of the wishes of ordinary electors, has done more to promote the revival of the less attractive forms of nationalism than the rabble-rousing of the Far-Right. And so . . . I vote Leave. Today, the third anniversary of my father's death, the community of St. Bede and St. Cuthbert Orthodox Church in Durham held a panikhida in his memory. Here are gathered Father Andrew Louth (formerly of the Department of Theology and Religion), Dr. Krastu Banev and his family, Deyan Petrov and my wife Jennifer and myself. 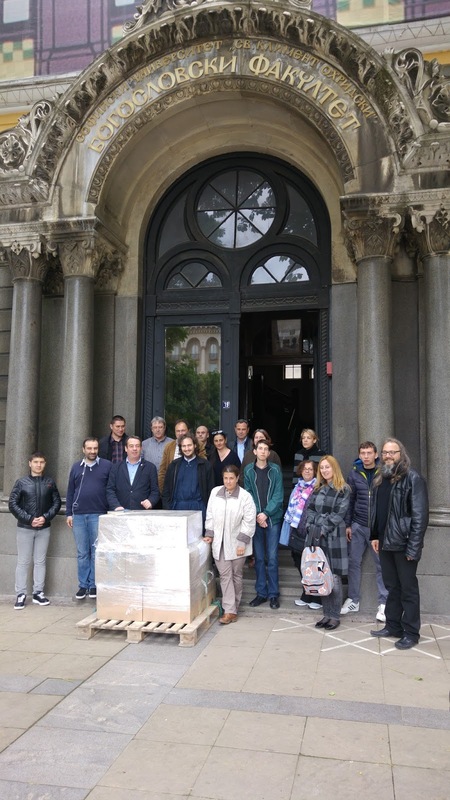 With the kind assistance of Deyan and Krastu, my father's entire patristic collection was catalogued over the past few months and this week shipped to Bulgaria where it will enhance the collections of the University of Sofia. 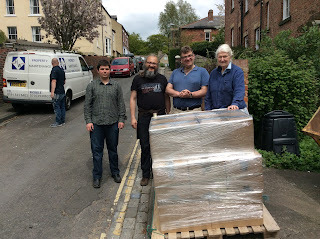 My father was ever committed to the principle that his books should endow an institution that was in genuine need of books and would make good use of them. Given his long association with Eastern Orthodoxy through the Fellowship of St. Alban and St. Sergius, I believe he would have approved that his collection, built up over more than fifty years, should find its home in the vicinity of Constantinople. Below the collection stands ready for dispatch on May 16. The books have now arrived at the Patristic Library of the Library of Theology Faculty at Sofia University. As one who lived for twenty years as a student and freelance historian in the United States, I know something of the struggle to obtain permanent residency (as a spouse) and at times felt irritation both at the bureaucratic hurdles and at the costs imposed on one whose family had contributed to the well-being of the American economy, both through tuition fees and direct financial support. I clearly didn't know when I was well-off. 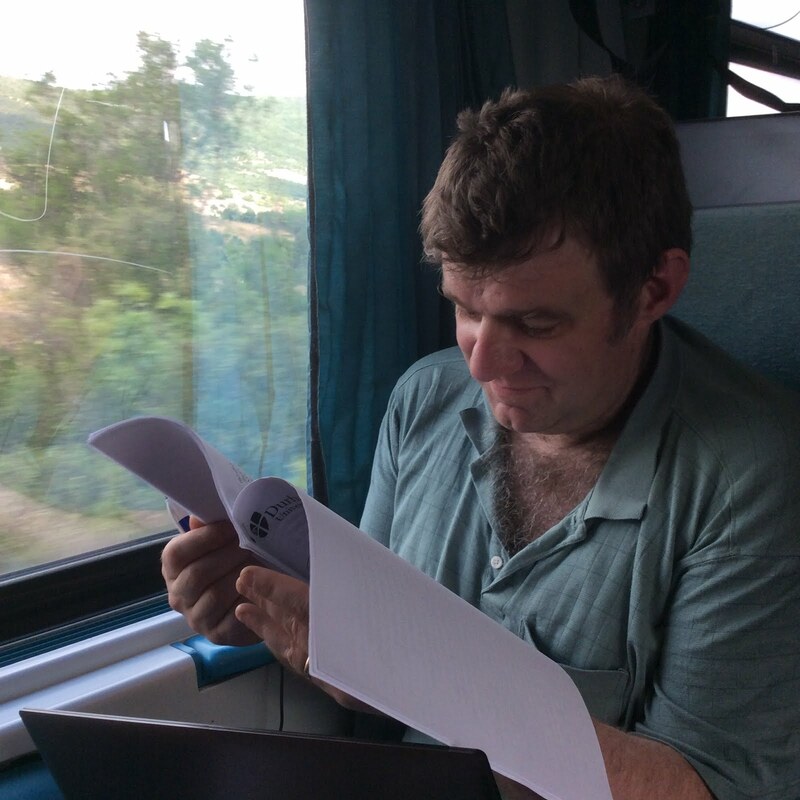 It came as a considerable shock to learn of the appalling treatment meted out by the Home Office to Dr. Paul Hamilton, an American scholar who, having completed a doctorate at the University of Birmingham and while applying for fellowships with the Leverhulme and Wellcome Trusts, sought further leave to remain, for which he paid a handsome £650. Not only was this application apparently denied on December 9, but the authorities failed to inform Dr. Hamilton of this fact and had him detained at an immigration centre on January 17 on the grounds that he did not have "enough close ties (eg. family or friends) to make it likely that you will stay in one place." Dr. Hamilton had already purchased an open return ticket to the United States (worth £800) and had he been notified of the denial of his application would have made his own arrangements to depart. The present government is only too happy to encourage "entrepreneurs" to resettle in the UK if they bring in sufficient assets, but apparently disdains a foreign academic willing to spend upwards of £100,000 of his own money to boost the resources of the British education system but who then seeks - not unreasonably - to secure a postdoctoral fellowship on the same basis as a British academic. The fact that Dr. Hamilton is a Shakespeare scholar only heightens the irony. The only official who comes out of this affair with any credit is the police sergeant at Leamington Spa who called the proceedings "completely ridiculous" and initially refused to process Dr. Hamilton. Dr. Hamilton is clearly owed both an apology and the return of his visa processing fee as partial compensation for his mistreatment. The precedent that it sets, if this judgment is allowed to stand, is alarming for the academic community at large. I have written to the Vice-Chancellors of my home institution and the University of Birmingham, as well as to the Home Secretary (copied to the Prime Minister and the Secretary of State for Education). I hope others will be moved to do the same. Update, January 29: Carolyn Pike (who appears to be the University of Birmingham's Director of Legal Services) informs me that "the University is not at liberty to discuss personal matters relating to alumni with third parties." I would never have imagined that one academic asking whether or not a Vice Chancellor would offer his support to another academic would provoke such a response (and from a legal officer rather than the official to whom the appeal was addressed to boot). Let us hope that this will not be another case of the "rich" getting the pleasure and the "poor" getting the blame. Further Update, January 29: It appears Dr. Hamilton is now a free man. Somehow one doubts that any official apology will be forthcoming. We are brothers.It's only the religion that is the difference, so I ask my brother Muslims to take care of the Christians so that the Christians also take care of us... and let us help one another and let us live together peacefully. It has been all too easy in the last few years to become preoccupied with the narrative of Muslims raised in the West who, while not necessarily complicit in the depredations of Islamist radicals, can still treat their actions as excusable in the context of the West's supposed moral decadence and "imperialist" intentions toward Muslim-majority nations. Furthermore, the hostility displayed toward Muslim converts to Christianity in non-Muslim nations (the deplorable case of Nissar Hussein comes to mind) raises justifiable concern about the commitment of Islam to wholehearted religious tolerance. Nevetheless, Our Lord's declaration that there is no greater love than that a man lay down his life for his friends is illuminated by the death of Salah Fareh. In his case, a choice was clearly presented, and yet he and his Muslim neighbours preferred death to security at the expense of the lives of their brother Christians. There is a message here that we all do well to contemplate. Humphrey: Statistics? You can prove anything with statistics. The above quote from the British comedy, Yes Prime Minister (the episode entitled "The Smoke Screen" for those who are interested) admirably captures the problem that Anglicanism currently faces. 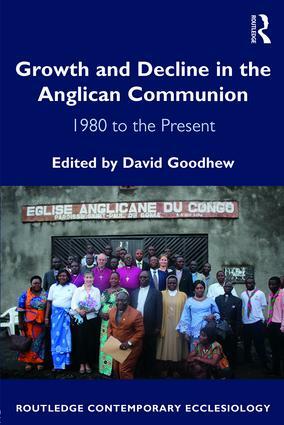 Later this year, Ashgate will publish Church Growth and Decline in Global Anglicanism: 1980 to the Present Day to which I have contributed the chapter on the demographics of The Episcopal Church (TEC). Statistics of church growth (and decline) have been the stuff of interdenominational wrangling for the past thirty years and frequently generate more heat than light. TEC is roughly at midpoint in terms of decline among the major mainline Protestant denominations. Furthermore, particularly in the last decade, almost every major denomination except the LDS Church has reported, if not a decline, at least a diminution in growth. A case could thus be made that recent declines in TEC’s membership are part and parcel of the general shedding of the nominally religious from membership rolls in recent decades and a consolidation of the faithful remnant. While I am not convinced that the loss of the “nominals” is the sole basis for TEC’s decline (particularly since 2003), it is comparatively easy to draw conclusions about the state of the Protestant mainline generally (and TEC in particular) given the efficiency with which statistical data is gathered year by year. Definitions of membership are clearly articulated and congregations and dioceses (or their equivalents) are routinely encouraged to update their statistical returns to take account of recent changes. Compare this with, for example, three of the largest African-American denominations, the Church of God in Christ, the National Baptist Convention, USA and the National Baptist Convention of America, which claim 5.5 million, 5 million and 3.5 million members respectively. In these cases, few local statistics exist to either sustain or refute the accuracy of the national figure (which has not even been updated in recent years). 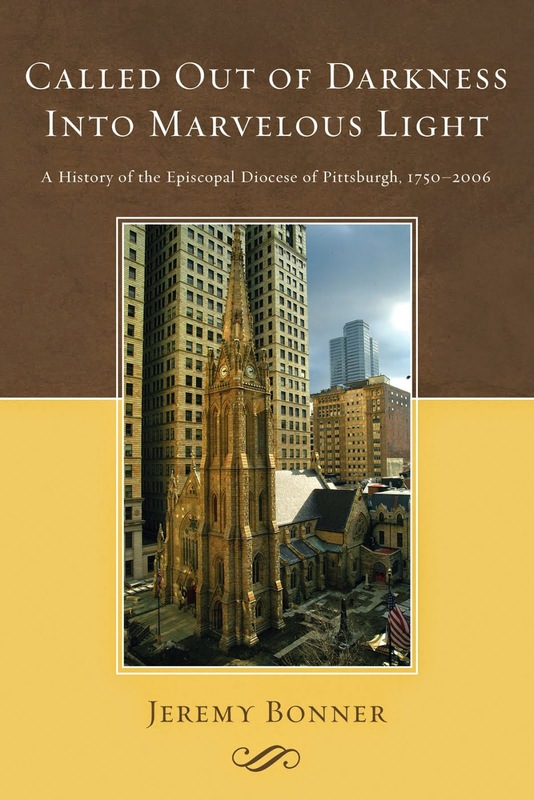 It is important to acknowledge here that while there are dangers in associating church growth with ecclesiastical health (dysfunctional or spiritually unbalanced churches can be extremely “successful,” as the Prosperity Gospel attests), most observers would agree that church decline, while sometimes inevitable, is problematic, whether in a congregation, a diocese or a denomination. The only sure way to judge growth and decline is by means of statistics that are current, reliable and consistent across the jurisdiction under scrutiny, all of which brings us to a recently published article by Daniel Munoz in the Journal of Anglican Studies. For conservative Anglicans, “North to South: A Reappraisal of Anglican Communion Membership Figures” will come as a shock in that it questions the narrative of Global South growth and Global North recession (at least in respect of Anglicanism) that has dominated recent debates. Some readers will be familiar with the findings of the 2013 report of the Center for the Study of Global Christianity, which shows significant gains for Christianity in Africa and Asia. 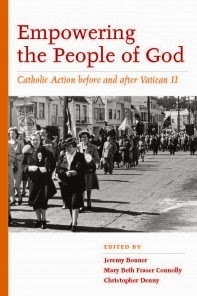 What Munoz reveals in his analysis, however, is that if such growth does occur, Anglicanism may not be the main beneficiary. 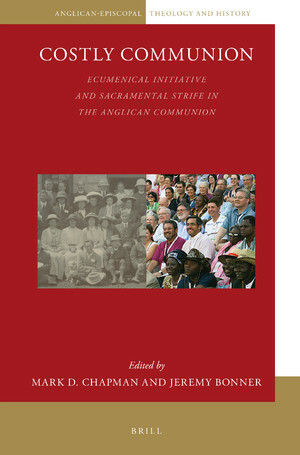 He notes, with some plausibility, that for conservative Anglicans to question the reliability of membership figures for the Church of England, while accepting uncritically those statistics provided by African provinces is to make a mockery of global comparisons, all the more telling when one considers that the Anglican Communion Office lacks current statistical data from 32 of its 38 member provinces. Although his focus is on statistics, Munoz offers some anecdotal – but revealing – evidence from African church leaders about the rise of nominal Christianity within their own flocks as well as the challenge posed by newer Pentecostal groups. 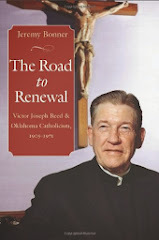 His main interest, however, is in exploring a possible gap between what he terms “outer circle” membership (the kind of cultural Anglicanism that lingered on in Britain until at least the Second World War) and “inner circle” membership, or those actively engaged in the life of the Church. To determine the latter, he appealed to national and provincial church offices and also sampled information on websites where those existed. Focusing on Kenya, Nigeria and Uganda, and relying on a degree of extrapolation from such data as was publicly available, Munoz estimates that inner circle membership within the Global South may only be about 3.9 million compared to outer circle membership of 41.4 million. Conversely, he estimates the Global North to have 4.6 million inner circle members compared to 35.7 million outer circle members. On this basis, the Global South would be considered to have 45.9 percent of inner circle Anglicans as against 53.7 percent of outer circle Anglicans. Such a finding hardly makes the Global South an insignificant presence in Anglican affairs but it serves as a reminder that playing the numbers game is a risky business. Judged in terms of inner circle membership, there would not be nine African provinces with over a million members but only one, Nigeria (which would actually be smaller than TEC). That said, Munoz’s research should serve as a reminder to the Global South that inflated membership figures are ultimately self-defeating. It may be wrong to articulate definitions of membership too narrowly, but definitions are needed and congregations and provinces have a responsibility to report numbers accurately and consistently. Anything else is ultimately a betrayal of the men and women in the pew who look to their leaders not only to proclaim the Gospel but to acknowledge the Church as she is, even while looking for the Church as she should be.